Save the date for The Garden Show 2019, presented by the Collin County Master Gardeners Association. Long established as a leader in all things horticultural, the 9th annual event will showcase new and creative ideas, informative presentations, vetted vendors, family activities, and fun entertainment. 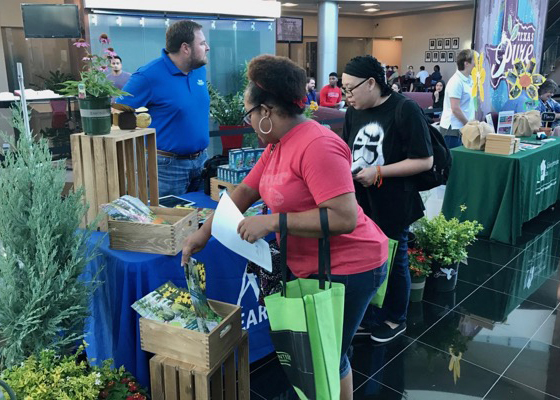 There is no better place than The Garden Show to learn about North Texas Gardening and Earth-Kind® Gardening principles. The Garden Show will take place on March 16 & 17, 2019 at beautiful Myers Park and Event Center in McKinney, Texas. If you’ve not attended The Garden Show before, the very first thing you’ll realize is we are different. If you’re a returning attendee, you’re going to love what’s new! Demonstrations and presentations will run throughout the show. Local experts will present on a variety of topics, including “Growing Tomatoes in North Texas”, “Earth-Kind® Gardening” and “Designing Beautiful Container Gardens”. The City of Frisco will have a 4-station workshop called “Irrigation Station” that will teach attendees how to water effectively, efficiently, and wisely. CCMGA is dedicated to our community, and each year we select a local organization to be our charity partner for The Garden Show. This year all proceeds from the $2 entry donation will benefit Hugs Greenhouse, the latest enterprise from Hugs Cafe. The mission of Hugs Greenhouse is to create an inviting place of training and employment for adults with special needs while providing dignity, self-worth and developing respect in the community. Known as Teammates, they focus on growing and selling fresh plant varieties that you can trust are hand-grown, watered, cared for with love. The Garden Show is an indoor event, so come rain or shine! Find room to grow at The Garden Show! Hours are from 9:00 AM – 5:00 PM on Saturday, March 16 and from 11:00 – 5:00 PM Sunday, March 17. Entry on both days is a donation of $2 per person. Parking is free! All proceeds will benefit Hugs Greenhouse. Visit www.ccmgatx.org/TheGardenShow or call 972-548-4232 for up-to-date information. The Garden Show is partially funded through a Promotional Grant from McKinney Community Development Corporation.